Arriving at Sun Valley, I expected cowbells to clang. After all, this is the most famous, historic ski resort in the country. Sun Valley is the “original”, home of the world’s first chairlift, on Dollar Mountain in 1936. The skiing at Sun Valley’s Bald Mountain is long and steep, dropping a demanding 3,400 vertical from 9,150′ served by seven high speed quads and a swank gondola that whisk you back up with stunning Sawtooth Mountain scenery and the trademark “Sun Valley sunshine.” Sun Valley is also sister resort to Snowbasin in Utah, same owner, and will be part of Vail Resorts’ Epic Pass 2019-202. On an Idaho powder day – Sun Valley has extensive bowl skiing that would prove awesome, and a switch from the consistently pitched groomed boulevards like Picabo, Gretchen’s Gold and Hemingway (trail names are the real deal here). Sun Valley’s green circle trails like Muffy’s Medals would be rated blue or black elsewhere. Sun Valley’s Dollar Mountain, a short drive away, is geared more toward learning families with more blue and green trails and free skiers with its terrain park elements and the new Superpipe – the largest in North America as of 2013 season. Sun Valley is super posh (and we have visited Deer Valley, Beaver Creek and even Yellowstone Club). Sun Valley’s luxurious timber lodges at the Warm Springs and River Run base areas and the Seattle Ridge summit on Bald Mountain cater to skiers with fine cuisine, leather couches by roaring fireplaces, and magnificent marble bathrooms ($8 million was the price tag on the latest Seattle Ridge Lodge). As for the snow, Sun Valley boasts the most sophisticated computerized snowmaking system in the world. With a push of a button, an inch of powder freshens the surface conditions most nights leaving a dusting of dreamy snow on the most trafficked trails. Sun Valley kids could easily become spoiled here with perfectly groomed trails, gorgeous ski lodges, and ski and boot valet at the base of the hill each night. A swift modern Round House gondola delivers skiers and diners in style to the original 1939 Round House – the first on mountain lodge that still serves Alpen fare with a fireplace and accordion music. Sun Valley’s Roundhouse is a must lunch spot, lobster bisque, cheese fondue, raclette, and chocolate fondue are a few of the traditional temptations. 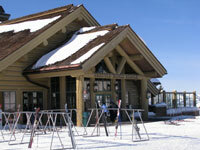 Other Sun Valley additions include a palatial Nordic and Golf Center, and an incredible performing arts Pavilion. 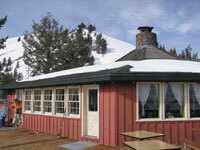 Stay at the 1936 Sun Valley Lodge, full of history in the hallways. The Lodge is a happening place for families with indoor and outdoor ice rinks, a huge outdoor heated pool, plus a bowling alley and game room. The concept of the ski week originated at Sun Valley Lodge and the Inn (1937), as skiers and movie stars came by train, now families come by SUV or the Sun Valley valet shuttle. 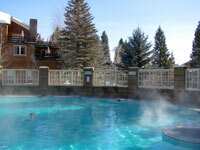 A new Sun Valley Spa debuts in 2016. Skate after skiing, or just watch the professional skaters on the scenic outdoor rink and think of scene from the famous flick, Sun Valley Serenade. For the shopper in the family, Sun Valley village has friendly dining at Gretchen’s and Bald Mountain Pizza plus a few gift and candy shops, or take a sleigh ride to Trail Creek Cabin for a family-style fireside dinner in the woods. Downtown Ketchum has more diverse dining, western saloons and shops.